This book shows how wide and generous orthodoxy is. No narrow legalism here. He writes with forcefulness and clarity, gentle yet demanding. Bianchi is clear – fierce, one might say – about the demands which faith, taken seriously, place upon both the Church and the individual believer. The spiritual life, properly and fully understood, is one lived in relationship with God. ‘It is essential today to repeat these basic truths, because we live in a time in which the life of the Church, dominated by pastoral concerns, has come to reflect the idea that the experience of faith is based on social involvement rather than on the discovery of a personal relationship with God lived in a community context’. 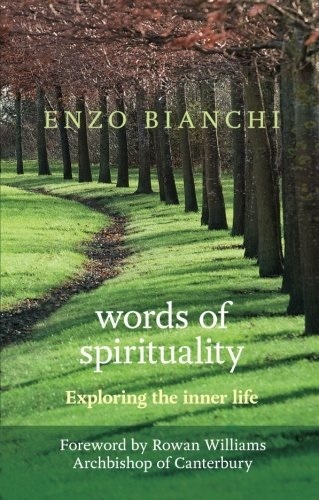 That community is, of course, the Church, with its sacraments, disciplines, liturgies and prayers, much of which Bianchi explores in these chapters. But he warns, right at the start, that ‘reducing the Christian experience to its ethical dimension is the quickest and most direct way to empty faith of its meaning’. Putting flesh on the bones of what the Christian faith entails above and beyond the ethical is the purpose of this book. Henri de Lubac, Karl Barth and others have helped us question the bland modern assumption that the Bible is primarily a set of historical texts, to be read and understood by criteria external to themselves. If it is true that there is no way of finding or being found by God that is not also a finding of one’s own humanity, then what is happening in the scriptural encounter is an unveiling of who we are — as human beings and as the particular people we I happen to be. In this encounter we meet the God who has already become present in us and seeks to be made known through us: we become a place where God’s glory may be manifest. The variety of scriptural narrative is testimony to the diversity of the modes of God’s presence in each one. So as we read, in community, in company with our brothers and sisters, we are doubly alert — to- what we are being taught about the calling, dignity and destiny of men and women, and to what we are learning about our own calling and gifting. The reading of Scripture is a genuinely sacramental event, one in which God’s act in the past, the present and the future is laid bare to us and in which we are ourselves caught up in that act. community collatio or discussion in which ideas were exchanged. In such moments of community dialogue, each person is at the same time abba and disciple of the others, on the one condition that he or she speaks and acts with authenticity. Perhaps it is not by chance that the verb askein, in ancient Greek literature, is also used to designate the work of the artist. This, then, is the goal of asceticism: to situate the life of the Christian in the domain of beauty, which in Christianity is another name for holiness. Christian beauty is not an object but an event. It is an event of love that narrates again and again in history, creatively and poetically, the folly and tragic beauty of the love with which God has loved us by giving us his Son, Jesus Christ. When Augustine says that the eye sees ‘from the heart’ and that only love is capable of seeing, he suggests that the spiritual senses are the body’s senses permeated by the profound experience of the love of God, a love that purifies, orders and grants intelligence to human love. ‘Go forth!’ (Genesis 12.1; the Hebrew can also be translated, ‘Go towards yourself’) cap­tures the spiritual significance of the journey through the desert. `The Lord is not slow about his promise . .. but is patient (makrothymei) with you, not wanting any to perish, but all to come to repentance’ (2 Peter 3.9). makrothymia, the art of ‘taking a step back’ in order to see the entire picture, and of accepting the incompleteness of the present. The Christian tradition has defined prosoche, ‘attention, as an attitude of ‘concentration, an inner ‘stretching towards, a ‘focusing of the mind’. The Greek word has a dynamic connotation, as do the Latin attentio and attendere, which tells us that someone who is attentive is someone who ‘reaches’ towards something. Attention is not the activity of a particular human faculty as much as a movement of the entire person, body and spirit…. The Greek fathers took advantage of the similarity the words prosoche (attention) and proseuche (prayer) to demomnstr how closely the two realities are related to each other. Attention that seeks prayer will find it, because prayer follows atten­tion, and it is to the latter that we should apply ourselves’ (Evagrius ); ‘Total attention is an aspect of continuous prayer’ (Hesychius ). allow us to welcome God’s life within us. Prayer leads us to decentre ourselves from our own ‘I’ so that our life can become more and more the life of Christ in us, and so that we can live as the Spirit guides us, as children of the Father. At the moment of his martyrdom, Cyprian of Carthage’s last words were ‘Deo gratias’; John Chrysostom ended his difficult existence with the same words of thanksgiving to God; Clare of Assisi, as she took her last breath, prayed, ‘Thank you, Lord, for creating me: These Christians made the conclusion of their lives a Eucharist. It is true that the prayer of thanksgiving considers the past and what God has done for us; it is ‘retrospective’ and flows from what we remember. But this prayer is also one that opens into hope for the future, and it is a specifically Christian way of living in the present, which is itself the space in which we live. neglected by local churches that are involved instead in countless social, charitable, recreational, and catechetical activities. Given this situation, the widespread interest today in forms of spirituality that are not Christian should not surprise us. the criterion in Christian obedience is the Holy Spirit, who interiorizes the demands of the gospel in each of us and leads us to see them as expressions of God’s will, so that we can then apply them to our lives to the point that they become expressions of our own will. In the light of this fundamental obedience, we can understand, accept and carry out other acts of obedience, in response to requests in which we perceive a mediation of God’s will. As we do so, we should always remember that everything should be governed by the gospel and submitted to the decisive criterion of the gospel. When forms of mediation of God’s will (ecclesiastical authorities, theological doctrines, monastic rules, cultural rites, etc.) take the place of God and claim that obedience is due to them, they should be subjected to criticism and led back to obedience to the gospel, because ‘we must obey God rather than any human authority’. recall the fact that the judge­ments made in ecclesial environments with regard to economic issues and situations are often inaccurate, totally incompatible with reality, based on archaic stereotypes that have little or nothing to do with today’s economic situations, and therefore ideological or simply useless. What I would like to do here is re-examine the issue of poverty on the basis of the gospel and New Testament message, in order to bring forth some indications for our life today….. Well before Jesus, Aristotle had already called the attitude of those who seek happiness by accumulating possessions `against nature’: possessions or wealth can only be a means, not an end. they are initially unable to distinguish their mother from food, they also seek nourishment in all that surrounds them. They ‘eat’ and take in voices, odours, shapes, and faces, and through this process they gradually construct a personality, relationships and an emotional life. This means that the symbolic value of fasting is connected to all of the external aspects that contribute to the construction of our identity. Other forms of asceticism cannot be considered ‘equivalents’ to fasting, because they are associated with other symbolic values and are thus unable to carry out fasting’s unique function. Different ascetic practices are not interchangeable! a person who sins is a human being, not a sin personified, and that he or she is much more than the sum of his or her actions, however negative those actions may be. If a Church centres all of its attention on ‘the other, it faces the risk of becoming an affective community closed within the emotional gratification of an exclusive `I—you’ relationship. Or it may lapse into rivalry and con­frontation, adopting an ‘I against the other’ stance and a missionary initiative that becomes imposition, and taking on the appearance of a sect that is aggressive towards the world. As yet another possibility, it may define itself as a source of charitable aid, a benefactor, or a philanthropic organization. In the first case communion atrophies and becomes sterile, in the second it is misunderstood and betrayed, and in the third it is reduced to charitable activity. `The other’ is not enough: we also need ‘the Third’ and his transcendence.